Skepticism ran through me like wild fire as the air date for the new season of Doctor Who came closer with each day. I began to dislike where Moffat was taking the series ever since the middle of series 6 with Matt Smith. Smith did a brilliant Doctor. The problem was that Moffat seemed to have no clue where to take the series. But, have we, in this first seasons episode, seen elements of the classic Doctor’s? I say yes we have. Capaldi’s portrayal of the “Twelfth” (depending on how you count) Doctor suffering from what I like to call regeneration/summoning sickness did indeed show elements of past regeneration sickness. The most notable was the Doctor’s memory loss after he regenerated. The most recent example of this was the Eighth Doctor’s regeneration where he suffered from temporary memory loss. The goofiness of how the Doctor was acting reminded me of the Third Doctor’s regeneration when he was being questionably protective of his shoes. Then we saw that he was actually protecting the TARDIS key from the doctors in a hospital and U. N. I. T.. How the Doctor was trying to recall what made the clockwork drone incident familiar was very Fourth Doctor, in my opinion. As far as the episode itself went, in my opinion, it was just OK. The writing was OK. The CGI for the T-Rex was OK. The only thing that I really, really enjoyed in this premiere, other than Capaldi as the new Doctor, was the new theme song! Never mind the intro graphics (which were pretty cool, and the eyes were the best part! ), but the new intro song reminded me of some of the older themes. When it comes right down to it, the only thing, it seems, that stands out for me with season 8 is Capaldi. I keep going over the episode in my mind again and again and again, and the only thing that stands out is his brilliant performance! He seems to truly bring back classic Who with his line deliveries. As I said, I found the episode only OK, but Capaldi… Peter Capaldi! You, sir, might give Tennant a run for his money as the Doctor! My hopeful outlook for the rest of season 8 has brightened a little. If Moffat can keep up the good writing for Capaldi’s Doctor, and add in more substance to future episodes, I feel that the bland run that were seasons 6 and 7 will end, and the search for Gallifrey will begin! And hopefully, the clockwork drones won’t become the next Crack in the Wall. 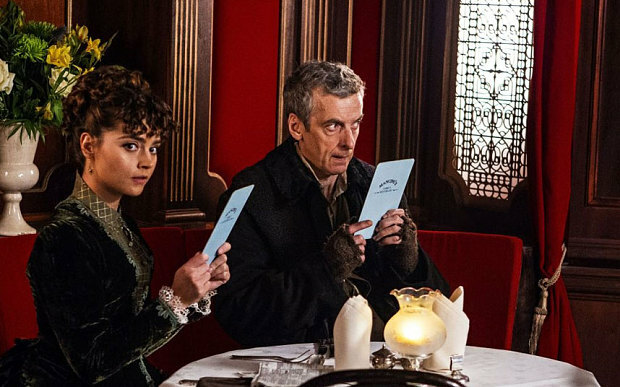 I know that this was a short review… But, Capaldi!